Combining iconic looks, superb road manners, and legendary performance, particularly when compared with other cars of the same vintage early 911s have become more and more sought after in recent years, and rightly so. The first 911 arrived in the US in 1965. These agile and capable sports cars, the 911 series cars gradually developed as horsepower increased and racing victories mounted. In the early 70s worldwide manufacturers struggled to comply with tightening U.S. emissions and safety regulations, often choking performance output from capable engines. Surprisingly, Porsche managed to improve the 911’s performance while still delivering a US compliant sports car. Indeed the Type 911/93 2,687 cc air-cooled, SOHC horizontally-opposed six-cylinder engine delivered 175 HP at 5,800 rpm, fed by Bosch C.I.S. fuel injection. Porsche continued to offer their legendary five-speed manual transaxle, with four-wheel independent suspension, and four-wheel hydraulic disc brakes. In addition to mechanical improvements, visual changes included updated bodies featuring new U.S. crash-impact bumpers designed by Wolfgang Möbius, who thoughtfully integrated the larger bumpers without compromising the classic 911 bodylines. Other improvements included strengthened floor pans, revised lighting, and a host of detail-oriented updates making the new 911 even better than before. The Carrera featured the 2.7-litre engine, expanding the top of the line 911S performance offering with the exclusive Carrera moniker that has since become legendary in racing and performance circles. 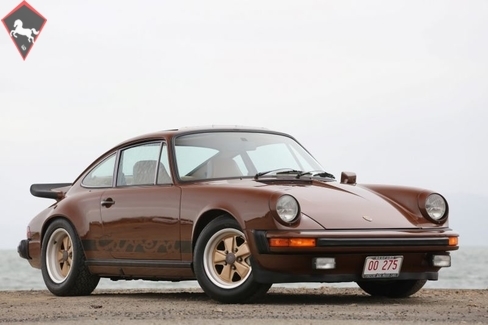 Built from August 1973 through July 1975, the 911 Carrera was available with the “Burzel” or “ducktail” rear spoiler in 1974, and for the 1975 model year, the “whale tail”. 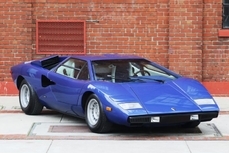 Of the total 2,243 examples built during this period, only 395 were US market 1975 Coupes. Contemporary press swooned over the new Carrera reporting remarkable performance figures and genuinely composed road manners – a combination that had previously eluded so many other sports car competitors. 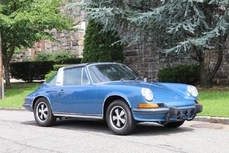 This exceptionally well-maintained and remarkably preserved original U.S. delivery Carrera was completed in April 1975. 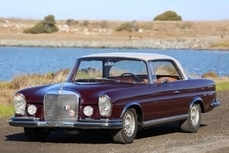 One of just 528 built for the US market, the car was finished at the factory in Bitter Chocolate over tan leather upholstery. 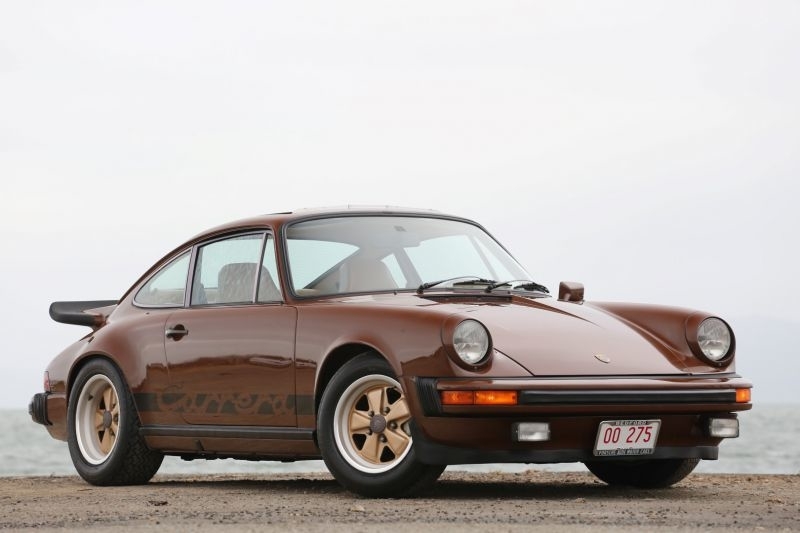 Ordered new with a list of desirable options, including Koni shocks, oil cooler, sport seats left and right, stereo speakers, gold forged alloy wheels, air-conditioning, and electric sliding sunroof, this Carrera becomes even more rare as so few were this highly optioned. 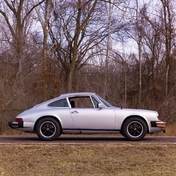 The first owner purchased the Carrera new through Porsche + Audi North of Dublin, Ohio on July 3, 1975, confirmed by its original window sticker, bill of sale, warranty voucher, and original purchase paperwork. The accompanying original owner’s manual and maintenance record book show stamped services through June 1976 when the car had traveled just 12,305 miles, supported further with service records into the 1990s and 2000s. Over the years, the car remained in Ohio with the owner participating in multiple Porsche Club of America parades and events. 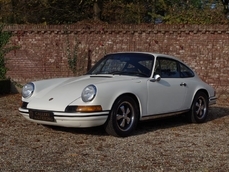 Today this remarkable Carrera presents in beautiful original condition with just over 69,000 miles indicated. 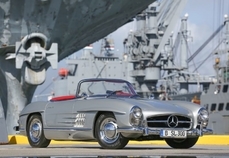 The car retains the original paint, as confirmed by paint depth readings, with the exception of the front bonnet, which was repainted due to normal road wear. The paint surface is glossy throughout with very nice rubber gaskets and seals, excellent anodized window trim, factory fog lamps, and handsome gold Fuchs wheels shod with recently mounted, factory-correct Pirelli 185/70 and 215/60 VR15 CN36 radial tires. The glass, body trim, emblems, lenses and Carrera side scripts are original and remain in very nice condition. 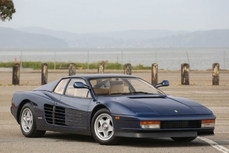 The overall visual condition of the car is cohesive and remarkably fine, especially considering the originality of the finishes. The original interior features optional leather sport seats, beautifully preserved dash with stunning original instruments, knobs, and switches. The working air-conditioning, power windows and sunroof, correct dealer-installed Blaupunkt radio, and plush carpeting (protected by period sisal floor mats) complete the handsomely preserved interior. The front storage compartment shows further evidence of originality with important factory items in place including correct spot-welds and paint markings, as well as the original date-stamped spare tire. 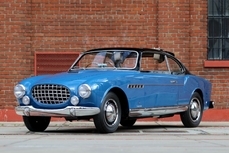 Under the hood, the matching numbers engine and engine compartment are in excellent condition throughout. The engine bay remains remarkably original and completely stock retaining all rare emissions equipment and optional air-conditioning components properly in place. The engine finishes are correct with correct clamps, hoses, and hardware. The engine compartment has also been very nicely detailed showing correct factory decals and labels. The undercarriage is as you might expect from an original and unmodified car, with no significant damage to the floor or support structure. Driving this car truly reveals the value of an original body retaining the structural integrity as delivered from the factory. The gearbox is smooth and effortless having benefited from a short shift kit. There is some play in the transmission mount, which is likely original. Once the engine is warmed up, throttle response is very good and the revs come on smoothly in all gears. Cornering is very nice with tight and responsive steering, Early 911s are delightful to drive, but an example of such originality truly commands the respect of even modestly capable drivers who quickly realize the performance once behind the wheel. In addition to the complete toolkit and case, jack, and a dealer-installed electric tire pump, the car is accompanied by a substantial number of original support materials including the original window sticker, bill of sale (two versions showing the final reduced selling price achieved after negotiations), VIN-matched original owner’s books in the factory vinyl sleeve, Emission Control System Maintenance and Warranty booklets, Blaupunkt CR-4074 radio manual, Marchal lamp manual, Weber A/C operating instructions, 1975 Porsche 911 Technical Specifications booklet, 1975 911 Technical Data Charts, 1975 911 Passing, Braking and Tire Reserve Load Data pamphlet, 1975 911 Service Information Book, MotoMeter tire gauge in matching leather sheath, a fabric Carrera banner, Porsche umbrella, and period repair and magazine publications. 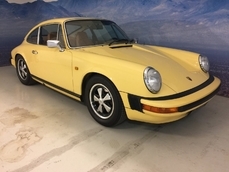 This exceptionally nice, original matching numbers Porsche 911 Carrera with rare factory installed A/C, Sport Seats, and sunroof options has been properly cared for and thoughtfully preserved with consistency and preservation in mind. With refined road manners and highly desirable options, this Carrera is ready for shows, events, and enjoyable performance driving. 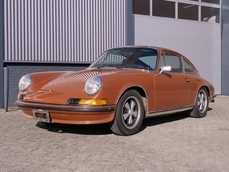 1975 Porsche 911 2.7 2.7 Liter Flat-6 no. 6451905* is listed sold on ClassicDigest in Emeryville by Fantasy Junction for $102500.